The Eating Insects Detroit Conference that took place from May 26-28th at Wayne State University was set to be the first of its kind. All the rock stars of the entomophagy industry were together in the same place at the same time, for the first time. There was a beautiful mix of academics, researchers, food experts, producers, farmers, chefs, you name it, all coming together for the first time to talk about the birth and growth of the entomophagy industry in societies that had previously turned their noses up at the notion. The keynote speakers were eloquent and passionate, and contained the likes of Ana C. Day of 4Ento, Meghan Curry from Bug Vivant, Pat Crowley from Chapul, Jarrod Goldin from Entomo Farms and others. Dr. Jarrod Goldin of Entomo Farms talked about “Entomo Farms: Contributing to the Global Growth of Entomophagy through the Farming and Processing of Cricket Protein”, Meghan Curry discussed “Carabiners and Crickets: Lessons from the BugWall”, Pat Crowley discussed “From Fringe to Mainstream: Perspectives on the growth of an edible insect industry”, and Ana C Day talked about “4ento- Our Team’s Journey”. There were so many highlights, but one that stands out in the minds of most was Detroit’s first edible insect culinary event that occurred on Thursday May 26th thanks to Detroit Ento a startup prototyping-farm, focused on insect protein for human food, together with Salt and Cedar of Eastern Market. The five-course dinner featured locally farmed insects (crickets, mealworms) as well as other notable and unique species. 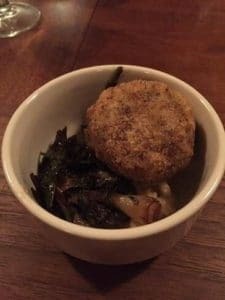 The meal was paired with cocktails and wine, prepared by local chefs, and served in a great local space. The event highlighted the techniques and palates of the chefs and showcased the versatility of insects as a delicious and nutritious food source. 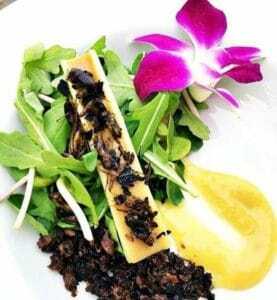 The first course was an appetizer that consisted of crisp celery with a miso-peanut butter gel, mushroom dirt, arugula, pea shoots, citrus-wild ramp dressing, ant eggs, and Montenegro soaked crickets. 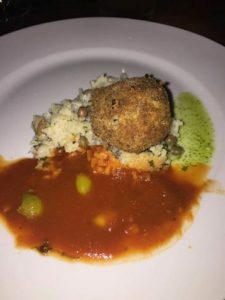 The second course was a warm starter of Panko / Cricket & Ant Larvae crusted Mealworm & Sago Worm Arancini on a Mealworm & Cricket Risotto with Oregano Oil. 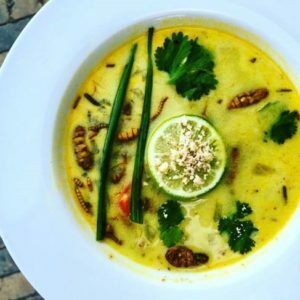 The third course was a spicy Thai curry coconut soup with a twist- it featured mealworms, silkworms, and wild rice. The fourth course was warm and flavourful. It was a savoury Silkworm & Mealworm Mofongo on Rice & Peas with a Smooth Buggy Sofrito and Cilantro Oil. Finally, the patrons were served with a rich chocolate cake. Blended to perfection with cayenne, brown sugar cream, cinnamon, service berry reduction, and ancho-lime chili cricket powder. 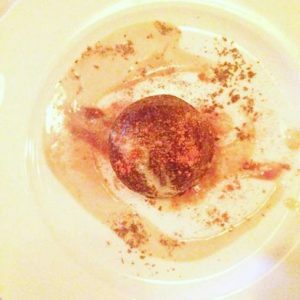 “ooh’s and ahh’s” were audible as the dishes came out, the crowd favourites being the Mealworm and Silkworm Thai Coconut Curry Soup and the Chocolate Cake with the Ancho-Lime Chili Cricket Powder. Just from the looks of the dishes, which would be your favourite? After the Eating Insects Detroit Conference, I think I can safely say that I would have asked for seconds of the Arancini and the Thai soup. This entry was posted in Blog, News and tagged Blog, Blogger, Blogging, Culinary, Eating Insects Detroit Conference, Edible Insect Industry, Entomo Farms, Entomophagy, Farmed Insects, Food Experts, Foodies, Insect Industry, insect protein, insects, Keynote Speakers, Thai Curry Coconut Soup, Wayne State University.